Panorama of the New River and its gorge from Long Point overlook. Courtesy National Park Service. Construction on the Long Point Trail—one of the most popular trails in the national park system in southern West Virginia—has been scheduled to close parts of the 1.6-mile route on mid-week days through September. 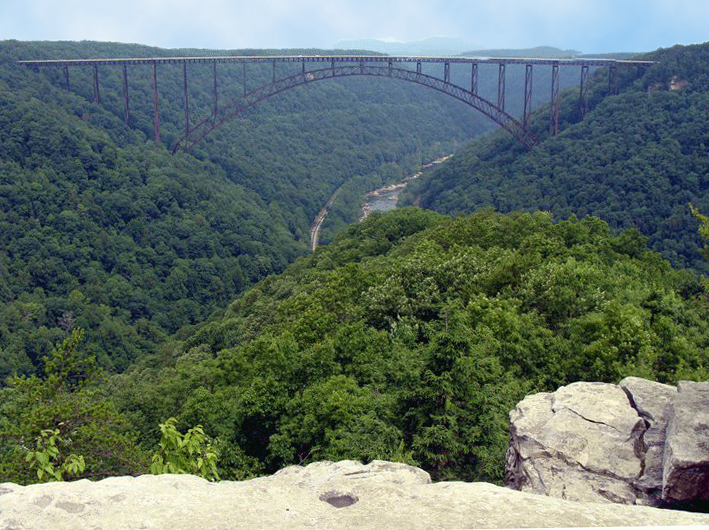 Once complete, the trail to a rocky overlook of the New River Gorge will include improved parking, interpretive signage, raised wooden causeways, and a wheelchair-accessible wildlife-viewing platform, according to Lizzie Watts, superintendent of the New River Gorge National River. Trailhead parking on Newton Road near Fayetteville, West Virginia, will be closed to the public from Mondays at 6 a.m. until Thursdays at 5 p.m., during which construction equipment and materials will be stored at the site, according to a park press release. Parking along Newton Road will also prohibited. Much of the trail, including the viewing area at the end, will remain accessible from the nearby Butcher Branch and Fayetteville trailheads, although trail intersections may also close intermittently. Visitors are being asked to not walk reroutes until the project is complete, according to the release. Work crews will address drainage and safety issues that have developed over the years as a result of the trail’s popularity and use. Additional water bars, raised wooden causeways and trail reroutes will provide a safer experience for hikers with less impact to the resource. New interpretive displays will be installed on the deck and along the trail and improvements will be made to the parking area, including accessible parking, the removal of boulders and vegetation for visibility, and the planting of native species in some areas to aide the privacy of local residents.